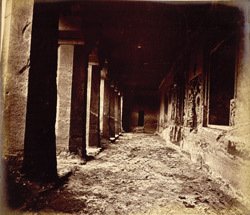 Photograph of the verandah of Cave V at Ajanta, taken by Robert Gill around 1868-70. The Buddhist cave temples of Ajanta were excavated into a horse-shoe shaped cliff overlooking the Waghora River in the 2nd – 1st Century BC and later in the 5th Century AD. The caves are numbered 1-28 according to their location, not chronologically. They consist of monasteries (viharas) and prayer-halls (chaitya) used by a community of Buddhist monks who resided there. Cave IV is the largest monastery at Ajanta but it was left unfinished in the late 5th Century. The verandah has eight octagonal columns and a cell at either end. The central doorway leading to the hall is decorated with figures of guardians and maidens and couples as well as Buddhas and ganas with garlands. To the right of the doorway there is a panel depicting the bodhisattva Avalokiteshvara surrounded by worshippers suffering torments to the left is a depiction of the miracle at Sravasti.